Index Advance is the next generation of Joseph Joseph's multi-award-winning chopping board categorisation system, designed to reduce the likelihood of cross-contamination of different food types. With silicone feet and soft-grip index tabs, these boards are a step ahead. 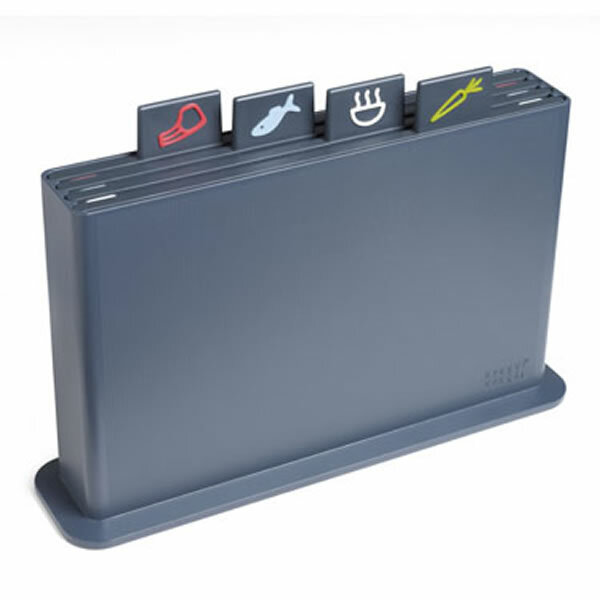 Joseph Joseph have gone further in this improvement on the old Index Chopping Board Set. The Advance system comes with silicione feet on both sides of the board to make them non-slip, while the index tabs have contrasting, soft-grip illustrations to make choosing the right board even easier. The stylish case sports an embossed grid texture in either dark grey or silver, and is easily cleaned with a quick wipe down with a damp cloth. The boards are fully dishwasher safe, and their texture won't blunt your precious knives. Each board is designed to be used with one type of food - vegetables, fish, meat and cooked foods.